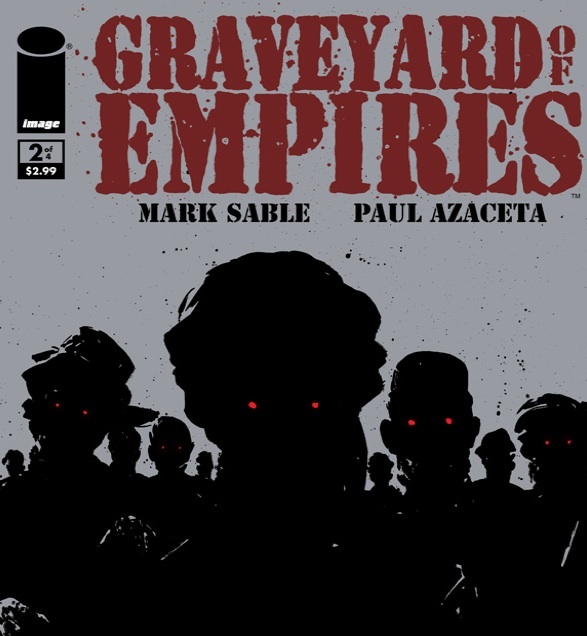 Mark Sable’s Graveyard of Empires Threads the Needle. Would the Taliban fight along side infidels like us if it meant not getting chomped on by zombies? That’s the million dollar question in Image Comics’ Graveyard of Empires. The thing that I like about Mark Sable’s writing is that he threads the needle incredibly well. He’s an intelligent writer who has done his homework on Afghanistan. He’s willing to acknowledge—sadly, a rarity in the industry—that the Taliban are scum (e.g., they force a doctor to implant bombs inside injured villagers). Tribal culture is explored. Dowry is discussed. There are villagers who would rather face bloodthirsty zombies than have their sister or wife frisked for explosives before entering a U.S. base. All of these things have helped make Graveyard of Empires a worthy read, especially for only $2.99 a pop. With that said, the book has its flaws. Mark Sable seems to have taken a page out of Oliver Stone’s book when it comes to crafting Graveyard’s “platoon.” It seems as though most writers can’t help themselves; they feel they must cover “the violent characters that populate both sides of the war.” U.S. forces need to have drug addicts, racists, and weirdos in their ranks. They can’t simply have guys like Captain America. They can’t have men like former Navy Seal Marcus Luttrell. Is it too much to ask to have an unabashedly pro-American tale told? Read Lone Survivor: The Eyewitness Account of Operation Redwing and the Lost Heroes of SEAL Team 10, by Marcus Luttrell for a perfect example of the kind of stories that are possible. Luttrell’s tale is more impressive because it really happened, but the point is that writers can create pro-American, pro-Western civilization tales that aren’t corny or cliched. While it’s nice that we have artists who try to see “the violent characters who populate both sides of the war,” it’s also nice not to believe in moral-relativist pap that actually creates the conditions for violence to explode. Previous Entry Earthquake Hits DC: Maxine Waters’ Resolve to Keep Spending Not Shaken. Next Entry Jim Carrey and Moammar Qaddafi: Creepy is Universal. Did you read the part in Lone Survivor where the team came across some goat herders on the way to their mission and had a vote whether or not to kill them? Some voted “yes,” but the “no’s” won out. That means some of the team took issue with killing unarmed civilians, while some didn’t. I think that those who voted yes, knowing it might have cost them their lives were the real heroes. What is right and wrong doesn’t depend on circumstances. Luttrell says he was among those who voted nay, and should also be commended for standing for true American ideals of honor and civility in a situation that in lesser men’s minds called for neither. Those goat-herders might have sold them out and caused the deaths of all but Luttrell. But those on his team that voted to kill the herders illustrates that there are “the violent characters that populate both sides of the war.” And honorable. Those tribal villagers who found him kept him alive and even drove away the Taliban because their “towel head” customs required them to aid a guest. They also have other customs, some based on a holy book and some on their culture. I’m sure Luttrell was happy for the custom that saved him. The point is, if Luttrell is telling the truth, some of his team did not share his honorable Western morals. That’s not “moral-relativist pap.” There are weirdos, rapists, and drug addicts in our military, and our general population too. And some people who would shoot unarmed people, torture, and commit other atrocities. Captain America is an ideal, and should be the standard, but sometimes isn’t. Did YOU read the book? Ask Luttrell whether he believes his battle buddies were honorable men — even those who voted “yes.” You missed the point completely. War is ugly, especially when you have an enemy that doesn’t necessarily belong to a nation state, doesn’t wear a uniform (per se), and often hides behind civilians knowing we go to great pains to avoid the kind of situation the SEALS were put in. The answer wasn’t an easy one, but it was made worse because they were scared if they made a mistake liberal rags would tar and feather their reputation, call for them to be tried for war crimes, etc. Please, I beg you. Go to a panel with Luttrell and ask him if he thought his team had men who weren’t honorable. I didn’t attribute any saying about honor to Luttrell. That was mine. Killing unarmed civilians IS a war crime. War is horrible, but if we are to claim the righteous cause, we need to take the high road no matter the cost or we are no better than base animals with no moral authority to judge any other “uncivilized” culture. And I’m pretty sure his team didn’t worry about what the “liberal rags” were going to write about a couple random murdered goat herders in the middle of nowhere. If *any* news outlet–whether conservative, liberal, or balanced–does not consider the killing of unarmed civilians to be a war crime in accordance with the Geneva Convention, please enlighten me which ones those are, exactly. Like I said, you obviously didn’t read the book… It says explicitly in the text that they were worried about what the New York Times and other outlets would write. And the goat herders weren’t “unarmed civilians” out for a stroll — they were Taliban or Taliban allies — who would have killed them in a heartbeat if they had a chance. That’s why they immediately sent hundreds of Taliban fighters after the team the moment they were let go.